Sukrit and I recently returned from the 41st Annual Saas-Fee Advanced Course. These one-week courses, sponsored by the Swiss Academy of Sciences, are designed to provide attendees with a thorough introduction to a particular subfield of astrophysics. Last year’s topic was “Astrophysics at Very High Energies” and the topic for spring 2012 will be unveiled later this year. The 2010 and 2011 lectures are available online, and bound copies from all years can be ordered from Springer-Verlag. The topic this year was “From Planets to Life”, and the attendees were treated to lectures by John Baross (University of Washington), Jim Kasting (Pennsylvania State University), and Jonathan Lunine (University of Arizona, currently on leave at the University of Rome Tor Vergata). How, where, and when did life evolve? Why did life evolve like that? Could life evolve in other ways? What are the defining characteristics of life? What are the requirements for life? Is there life elsewhere in the solar system? Elsewhere in the universe? John Baross introduced us to the fascinatingly odd lifeforms thriving at hydrothermal vents in the deep ocean and brought us up to date on the search for LUCA, the last universal common ancestor of life on Earth. The highlights of Professor Baross’s lectures were captivating high definition videos of deep sea life taken by robotic submersibles. Click below to watch a similar (lower resolution) video and turn on the sound to listen to the great commentary. Leaving the Earth, we also discussed the requirements for life on other planets and how astrobiologists might detect and characterize life on other worlds. We’ve mentioned the phrase “habitable zone” several times on astrobites, but we haven’t addressed the history of the subject. The habitable zone was first proposed by Dole in 1964 and Hart in 1978, but Jim Kasting’s 1993 publication is commonly referred to as the “seminal work” on the habitable zone. In that paper, Kasting et al. determined the minimum and maximum distances from the Sun at which liquid water would be stable given the stabilizing effects of the carbonate-silicate cycle. The inner edge of the Kasting et al. habitable zone is governed by UV photolysis and loss of hydrogen, while the outer extent is limited by the condensation of CO2 clouds that increase the planet’s albedo and cause it to cool. Using these limits, Kasting et al. arrive at the classic model of the habitable zone shown below. In his lectures, Professor Kasting reviewed the habitable zone and discussed the evolution of the Earth’s climate through time in the context of detecting biosignatures on other planets. 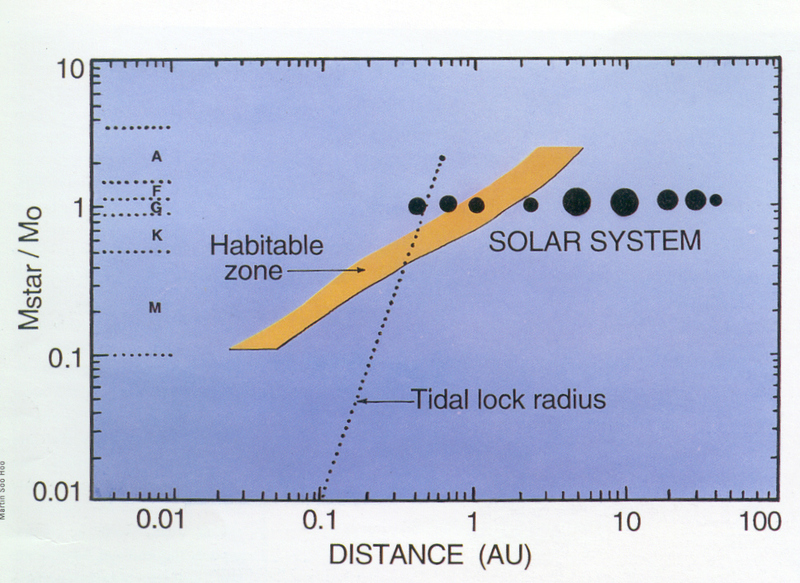 The habitable zone derived by Kasting et al. 1993. The yellow band demonstrates the distance from the star at which liquid water would be present as a function of stellar mass (on the y axis). The solar system is shown for reference and the dashed line indicates the orbital distance at which a planet should become tidally locked. Figure from Jim Kasting's website. Jonathan Lunine’s lectures covered a range of topics in astrobiology from planet formation and detecting transiting exoplanets to searching for life in our solar system. Professor Lunine has written many papers about Titan, and he delivered a wonderful lecture about searching for life there. As Cassini and Huygens have shown us, Titan is an intriguing moon well worth further investigation. As Professor Lunine pointed out in his lectures, one of the advantages of detecting life on Titan rather than on Mars is that Titan life is likely to be so different from Earth life that there won’t be confusion over whether life evolved once and then colonized both worlds or whether life evolved independently. In the case of Mars, there has been so much transfer of materials over the years that it would be difficult for scientists to determine whether life arose independently on Earth and Mars or whether life was delivered from Mars to Earth (or vice versa). 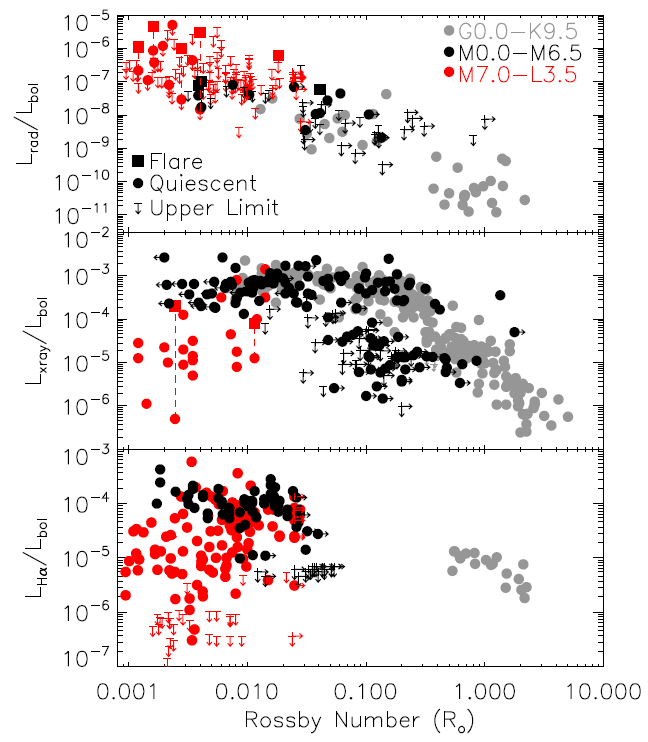 The Kepler Exoplanet Census The Radio Activity-Rotation Relation of Ultracool Dwarfs How Hot is Too Hot? Habitability Whether Rocks Weather or Not?